Feng shui, mood rings and marketing have long utilized emotive associations with color. One might avoid painting their bedroom red if they want a good night’s sleep, or try to eat off of a blue plate if they wish to eat less. One group of researchers (de Craen et. al.) wanted to see if these associations crossed over into the medicines we consume. In their literature review they found that in placebo trials sedative effects were repeatedly associated with blue colored pills, while red, yellow, and orange pills were associated with stimulant effects. There were even studies which demonstrated color effects the perceived strength of a particular capsule. White capsules are perceived as weaker, while black and red colored medicine is often associated with higher potency. There is still limited research in this area of study, but luckily placebo research is on the rise. Preparation of a drug, interaction with the prescribing doctor and perceived competency of a doctor all contribute to the therapeutic outcome as well. Placebo research is often used in critique of pharmaceutical formulations, but I believe it provides an optimistic and empowering awareness. After all, if something as subtle as color influences one’s treatment, there is something to be said about the mind/body connection. 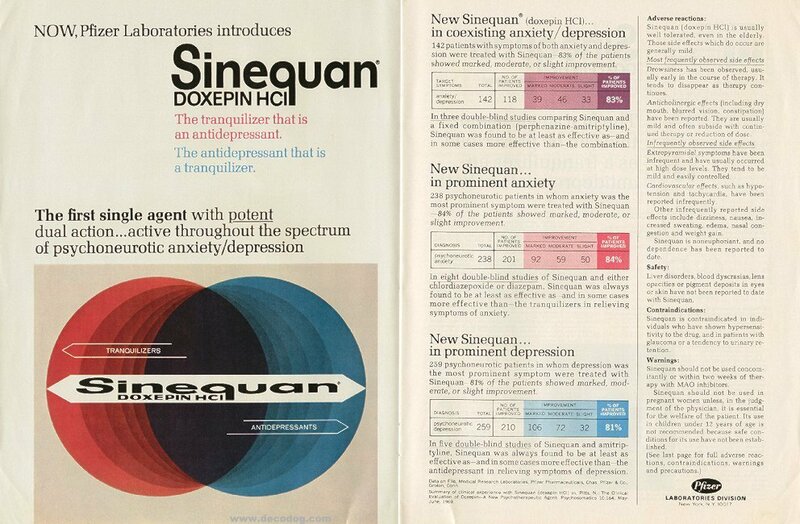 This vintage ad of Sinequan – a dual acting antidepressant and tranquilizer, plays up color associations. In blue it reads, “the antidepressant that is a tranquilizer” while in red it says, “the tranquilizer that is an antidepressant”. Scholarly Stuff: Harvard Psychologist, Irving Kirsch, researches placebo effect. In his studies, he has found that difference between anti-depressants and placebo is clinically insignificant, in fact… more people are helped through placebo. His book, The Emperor’s New Drugs provides many eye-opening theories for why this may be the case. → One of THOSE days. Why do we love complaining?